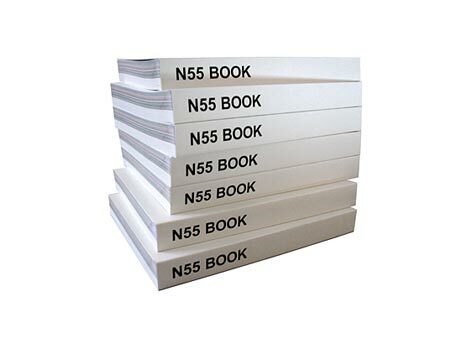 N55 BOOK is an accumulation of manuals for different things made by N55. New manuals and developments of existing manuals will be published continuously on www.N55.dk. 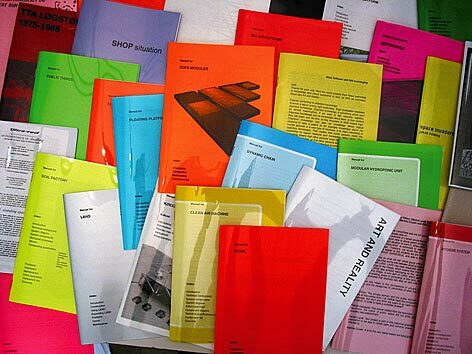 Most of the manuals have been published separately between 1996 and 2003 as periodicals and on the N55 website. They do not appear in N55 BOOK in chronological order A digital version of N55 BOOK can be downloaded for free here. All N55 works are Open Source provided under the rules of Creative Commons as specified here. Any use of N55´s works must include proper credits to N55 and a link to www.N55.dk. N55 will be thankful to be notified on n55@n55.dk whenever material is being used. Music by Anders Remmer for a number of N55 things can be downloaded for free here. (The files are in MP3 format). The price for purchasing N55 BOOK covers work, materials and manufacturing. N55 in collaboration with Alec Due. N55 in collaboration with Brett Bloom and Charles Lock. Narayana Press, Odder, Denmark 2003. Edition: 1500 ex Weight: 830 g.
Font: Helvetica / Helvetica Bold 14, 10, 9 and 7 pt. Ny Carlsbergfondet, the Danish Council of Visual Art, Politiken-Fonden and Danish Contemporary Art Foundation. Photographs by Maria Gotthard on pages: 12, 14, 15, 18, 23, 26, 29, 30, 33, 36, 41, 44-45, 48, 50, 54, 57, 60, 68-71. Photographs by Alec Due on pages: 91, 96-97 (air photo), 126-127, 132. Photograph by Horst Griese on page 166. Photograph on page 79: figure from "Buckyworks", J. Baldwin, John Wiley & Sons, Copyright 1996, reprinted by permission of John Wiley & Sons, Inc.
Erling Sørvin: N55 SPACEFRAME, parts of the FLOATING PLATFORM and parts of DYNAMIC CHAIR were developed in collaboration between N55 and Erling Sørvin and employ his research on building struts. According to agreement, parts from N55 SPACEFRAME have been used as constructive elements in other N55 systems developed without the collaboration of Erling Sørvin. Marius Hartmann, Lennard Grahn, Johannes Christoffersen and Nikolaj Meedom collaborated on the project FREE CHOICE in 1994. Philosopher Peter Zinkernagel, who discovered logical relations and for 4 years was a discussion partner of N55. Anders Remmer for soundtracks. Ole Geyer for making a lot of things possible. Maria Gotthard for photographs. Brett Bloom for his collaboration and support on numerous occasions. Frank B. Petersen for technical assistance. Nel Lise Sørvin for support and the translation of ART AND REALITY. Marianne Wendt for editing and translations of manuals. Søren Kjørup for philosophical advice and support. Bent Vestergaard for advice on the development of HOME HYDROPONIC UNIT and CLEAN AIR MACHINE. Peter Brix for collaboration on development of YTEICOS and general support. Finn Thybo, Kirsten Dufour, Keith Pirlot, Heine Skering, Michelle Grabner, Brad Killam, Jytte Fabricius, Carl Sørensen, association De Verbeelding, Mogens Otto Nielsen, Agathe Nisple, Emil Nisple, Dan S. Wang, Sarah van Orman, the city of Utrecht, the village of Les Arques, Oana Felipov, accès(s) Pau, for including land in LAND. Mandy Stern-Pirlot and SECTION8 for collaboration on SMALL FISHFARM and CITY FARMING PLANT MODULES. Laust Nørgaard for advice on the construction of FLOATING PLATFORM. Rebecca Gordon Nesbitt, Lars Bang Larsen, Craig Martin, Will Bradley, Stina Teilmann, Terje Traavik, Søren Kjørup, Brett Bloom, Dan S. Wang, Sarah Van Orman, and Tewolde Berhan Gebre Egziabher for contributions to N55 BOOK. Ateliers des Arques for residency during parts of the work on N55 BOOK. Alec Due, People at Quintusholmen, Charles Lock, Peter Nergaard, Karen Ingemann, Brigitte van der Sande, Tom van Gestel, Trudy van Riemsdijk-Zandee, Paolo Bianchi, Lars Bang Larsen, Gianni Jetzer, Rudolf Sagmeister, Maria Lind, Horst Griese, Eva Schmidt, Jacob Fabricius, Pascal Pique, Dispute Resolution Services, Anders Kreuger, Taro Shinoda, Junko Shimada, Dan Cameron, Gitte Ørskov, Lennard Grahn, Marius Hartmann, Nikolaj Meedom, Jakob Jakobsen, Henriette Heise, Jan Johansen, Søren Andreasen, Jørgen Michaelsen, Maia Damianovic, Manuela Ammer, Lene Stæhr, Jane Løvschall Dolmer, Annika Ström, Iwona Blazwick, Magali Arriola, Temporary Services, Yas Kumagai, Kent Hansen, Christine Buhl Andersen, Lisette Smits, Mariette Dølle, Wendel ten Arve, calc, Brad Killam, Michelle Grabner, Laurie Palmer, Pedro Lapa, Deborah Smith, Kate Fowle, Okwui Enwezor, Johan Pousette, Bernhard Fibicher, Åsa Nacking, P-House, Min Nishihara, Hiromi Ohashi, Kestutis Kuizinas, Thorbjørn Limé, Bjørn Wangen, Marta Kuzma, Projektgruppe Hamburg, Milika Muritu, Theresia Kiefer, Kari Mjaatveit, Lise Nellemann, Karlsøy Kommune, Sigmund Bjørndal, Red76ArtsGroup, Parfyme, Lucy Orta, Aktion Koloni, Kunstlerhaus Hamburg, Iris Dik, Peter Henkes, Susann Rönnertz, Anneli Nilsson, Galia BarOr, Charlotte Brandt, Antje Schneider, Tomas Ruiz-Rivaz, Gavin Morrison, Nicholas Audureau, Jacob Tue Larsen, Lars Pedersen, Lise Sattrup, Kirse Junge-Stevnsborg, Dieter Buchart, Petra Schröck, Martine Cousin, Gavin Wade, Tor Inge Kveum, Per Gunnar Tverbakk, Richard Kelley, Kayle Brandon, Marion Baruch, Dale McFarland, Maureen Finn, Henriette Bretton-Meyer, Stella d'Ailly, Siraj Izhar, Michelle Marxuach, Hubert Salden, and all the other people who have helped and collaborated with N55 in relation to publications, lectures, workshops, exhibitions and other things.